Some people may argue that latex foam mattresses provide better support and comfort than traditional memory foam. This product from the rubber tree is breathable, it reacts to pressure rather than body heat and it’s incredibly durable. Buying the right latex mattress comes down to your individual needs. The Sealy Posturepedic 2000 Latex Single Mattress ticks all the boxes for us because it is reasonably thick, offers medium firmness for a blend of comfort and support and it won’t set pockets back too far, either. When you’re looking for a latex mattress, you may also want to consider whether you want a pocket sprung base and latex top, or just a full latex mattress, although you may want to bear in mind that the cost of a latex mattress is generally more than a mixed mattress. You may also want to think about whether you want the benefits of a hypoallergenic cover and the amount of pocket springs you require (the more there are, the more support it’ll provide). Combining the support of 2000 individual pocket springs and a latex foam layer, this medium mattress promises superior support and comfort. With the springs evenly distributing your body weight and the latex layer relieving your pressure points, side sleepers especially, should find that mattress provides a comfortable, fresh, anti allergy sleeping environment. If you’re looking for a comfortable, supportive mattress, this Sealy proves that you don’t need to pay over the odds. In addition to being sustainably sourced, this mattress provides superior all-round support thanks to its seven comfort zones. While it may be tempting to go for a cheaper memory foam mattress, foam mattresses made from latex contain microscopic air bubbles that ensure you remain cool and dry throughout the night. With anti-allergenic, anti-bacterial and anti-microbial properties, this mattress is ideal for allergy sufferers and it should remain fresh and hygienic throughout its life. Combining the powers of pocket springs and latex, the Silentnight Mirapocket should guarantee a great night’s sleep. 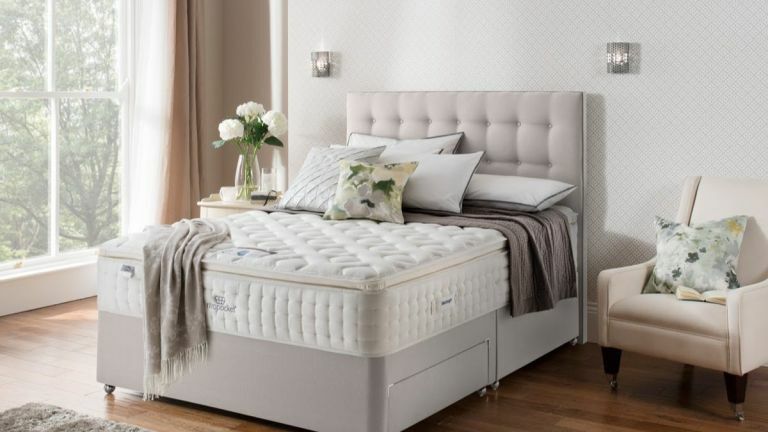 With a massive 2800 springs distributing your weight and a responsive latex layer that relieves pressure points, this intelligent, multi-zonal mattress provides specific support to each area of the body – from firmness for the lumbar to softness for the shoulders. The crowning glory is in its pillow top, which increases softness and adds that additional layer of luxury. If you prefer your bed to be one gigantic marshmallow, Evelyn is your girl. Despite its softness, the mattress still offers a good level of support thanks to the 2000 individual pocket springs and molding latex foam layer. The mattress has been treated to eliminate mould and deter dust mites, which should make it suitable for allergy sufferers while keeping it fresh and clean throughout its lifetime. This mattress proves that you don’t have to pay an arm and a leg to purchase breathable memory foam. Featuring Coolmax fabric to ensure breathability and an internal 3D band to further increase airflow, this mattress should bust all myths that memory foam makes you hot at night. It ticks just as many boxes as other mattresses on the list, including treatment to make it hypoallergenic and nature friendly sourcing. To top it off, it features a fibre summer side and a wool winter side for optimum sleeping conditions throughout the year, making it certainly worth the spend.